I thought today we could enjoy our tea outside. I am sharing a new to me tea mug and saucer set. This is not a normal type of delicate teacup I usually buy. But, for some reason, when I saw it, I just really liked it and thought it would make a nice everyday set for me. See, it was just a pretty little fun tea set. I used a recently thrifted metal silver tray. It was only .25 cents and has quite a bit of rusted areas. But, that is okay by me because I picked it up to redo it. 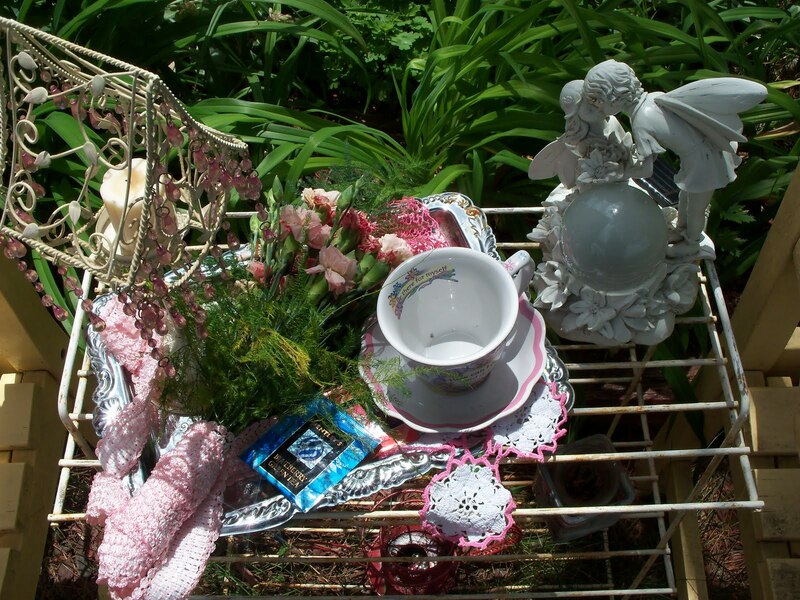 At the same yard sale I picked up the tray, I also got these two little pretty lace work pieces for .25 cents each. 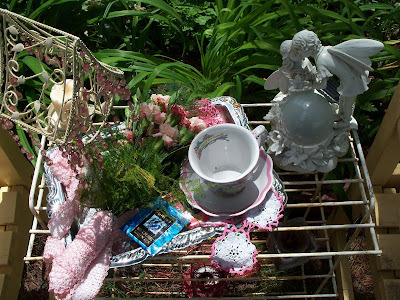 Okay, I know that everyone is saying why does Diann have a dead bouquet of pink carnations on this tea tray. Well, I just think when they are dried up like this, they are still beautiful and I wasn't ready to throw them away. As a matter of fact, I think I am going to hang them in our pantry and let them completely dry out. Do you let your fresh flowers dried completely out and then use them to decorate with? I just wrapped some wide cotton lace trim around the stems. Thank you for stopping by for a little tea with me in the garden today. I hope the rest of your day is beautiful! What a cute little tea set. That is a cute saying on it also. Love the tea set, and I like the saying in it. Oh Diane this little tea set is adorable. This tea set looks so much like one I gave a friend of mine years ago from the Gooseberry Patch catalog years ago when they sold other things besides books. I never got one for me but always loved it. I'm going to look it up. I love to dry flowers too (upside down) and then put them in something. I dried the sunflowers my son gave me for mothers day and looks so good. Roses dry especially nice; they looks so vintage. So pretty! I always hate to throw out flowers too. Looks like a lovely place for tea!